Hiya guys! I really do hope you've had a better day than I have. I seriously just wanna be quiet for the rest of the day after a work day like today. I must have answered at least sixty phone calls, mostly having to say the same thing over and over again. So I ended up dozing off and not getting this post as punctual as I would of liked, you forgive me right? I still have to get used to my new schedule and this little thing called 'pre-planning'. Lol. Anyway, for today I have to share with you a watermarble I created a few days ago using some Wet n Wild Megalast beauties. Cost efficient and good for marbling? Yeah, I'm so glad I got these. I cannot believe I've had these colors just sitting on my desk unused this whole summer. I first got inspired from @whoa_its_jessica on Instagram and then completely forgot to actual do the marble after I found the polishes. It's not perfect, unfortunately, and does have quite a few air bubbles. But I'm still not counting this as a fail because I finally got some design action going in the water. I used to do monthly marbles with my bestie Cheyenne, but since we've both been so busy we've been slacking on them. Since I only used three of the six/seven polishes in this collection I feel like I need to do another one.... or another five. Practice does make perfect after-all. Polishes used are Beat of a Generation, Coast to Coast, and Trippin' on the Boardwalk from the Wet n Wild Summer 2014 Limited Edition All Access Beauty Collection. I don't know if these are still available in stores, but it's definitely worth checking out. I used a white polish from Sally Hansen as the base coat and Fairy Dust by China Glaze for the glitter topper. 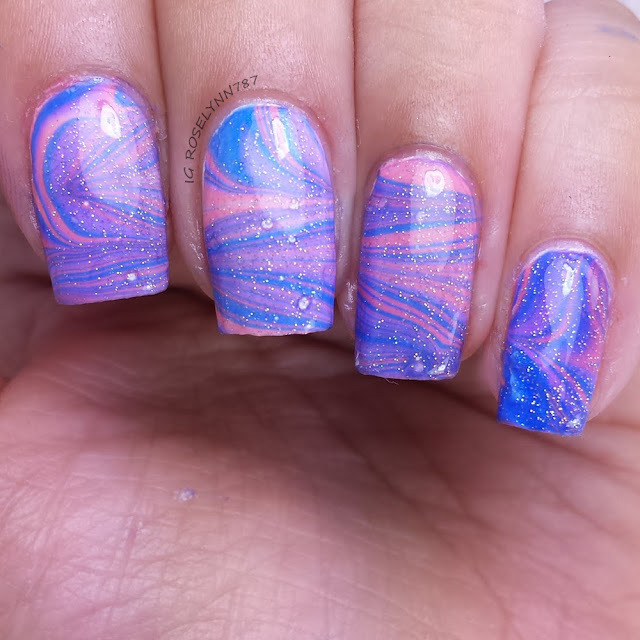 One of these days I'll do a watermarble without using Fairy Dust haha. 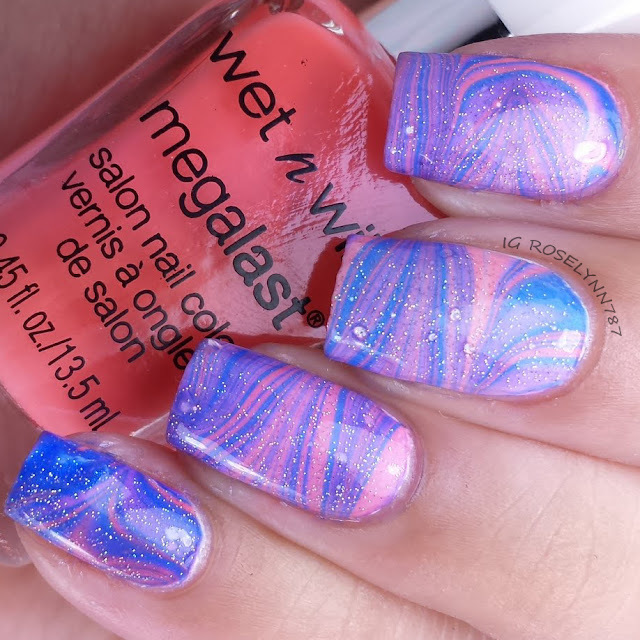 I hope you guys like my watermarble and if you'd like to see a tutorial or another variation with colors from this collection let me know. Thank you! I definitely want to do another one really soon. Maybe tonight XD I haven't owned marbling polishes that work this well before.